As we journeyed through Barcelona and Madrid locals would often ask us where else in Spain we were visiting. As soon as they heard San Sebastian we were prompted with the question, “are you eating people?” Of course we always responded with a big YES! Everyone always had a suggestion or two for us; we took much of the advice we were given, never with any disappointment. I’ll be doing another full post on our top 15 favorite places we ate at in Spain, but I wanted to share a list of restaurants specifically in San Sebastian with a dish or two that are “must haves” at each establishment. That way you can plan your own pinxtos crawl! While most bars have over two dozen options, try to limit yourselves to just two or three items at each place, sharing as you go. We also suggest you look to the restaurant’s blackboard for specials, which are often tastier and made to order compared to the colorful offerings heaped right on the bar. In reality, you can’t really go wrong. We were told by friends the best place to stay in San Sebastian is the old town quarter which is entirely pedestrian and where the majority of the famous pinxtos places are located. We ended up choosing an adorable loft-style Air BnB in the center of the old town with pinxtos bars no more than a few feet away. San Sebastian is one of the most famous cities in the world because only Kyoto Japan has more Michelin Starred restaurants per square yard. Out of the seven restaurants in Spain with three Michelin stars, three are in the San Sebastian area: Akelarre, Arzak, Martin Berasategui. Chefs from around the world come to train at these restaurants and bring back the knowledge they gain to their own kitchens. In fact, one of my friend’s cousins trained at Akellare and is now opening his own Basque restaurant in New York City. After doing some research we discovered that most of these three-star restaurants were priced similarly to Alinea in Chicago, which can be a vacation budget in itself. We decided on Kokoxta, a one-star Michelin establishment located conveniently in the city center, where we dined on seven beautiful and delicious courses, paired with a delicious tempranillo wine. More to come on this experience in our next blog post! 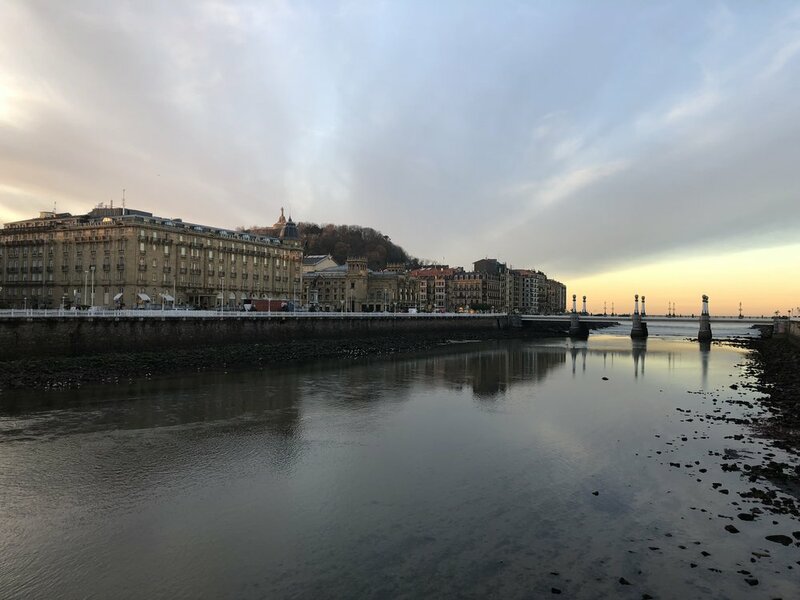 As I was researching what to do besides eat in San Sebastian, I came across a blog post that described a hike you can do from San Sebastian to the nearby fishing village of Pasajes de San Juan. The path begins after a short hike up Ulia mountain that borders the east side of the city, just past the Zurriola Beach (the surfer’s beach). From there you have a three-hour scenic walk along the coast dotted with beautiful coastline views, old aqueduct bridges, and even a castle on a hill! The hike is actually a small part of the bigger Camino De Santiago trail network that traverses all of Spain. The walk itself is pretty beginner level and would be good for even a family with children; just remember to bring water and snacks! There are a few rocks/stairs to scramble up, so tennis shoes are needed, but it’s not overly physically taxing. There are signs along the way marking the trail and announcing the distance left till San Juan. This was absolutely one of my favorite things we did in San Sebastian as the views were breathtaking and some of the best photos I took on our trip were from this hike. There’s a long boardwalk (about two miles) all the way from the east side of the city from the aquarium to the west side to the funicular at Mount Igeldo. Even though it was late November we still saw a few brave souls swimming in the water! We decided to stick to the shore and enjoyed a leisurely stroll that passed by the lovely grounds of Miramar Palace. Miramar Palace is a late 19th century palace that overlooks La Concha Bay and is just a little over halfway through the walk. It was the home where the Spanish royal family used to spend their summers. Today the palace’s great lawn is an open park and a wonderful place to lounge and watch the world go by. Make sure that every now and then you stop and take a break from looking out at the ocean to the view of the mountains right behind the city, they are almost as beautiful! We heard great things about the aquarium in San Sebastian and saddled with a super stormy day we decided a break from pinxtos was needed and decided to give this place a shot. On top of housing colorful fish from around the world, one of the floors is also a museum dedicated to the naval history of the area and has the honor of being the first natural science museum founded in Spain. My favorite part of the aquarium was the largest tank filled with so many types of fish and even two big sharks with a view from all angles including a walk-through tunnel. If you stand in the middle of the tunnel it makes it feel like you like you’re in the tank with them as they swim over your head. 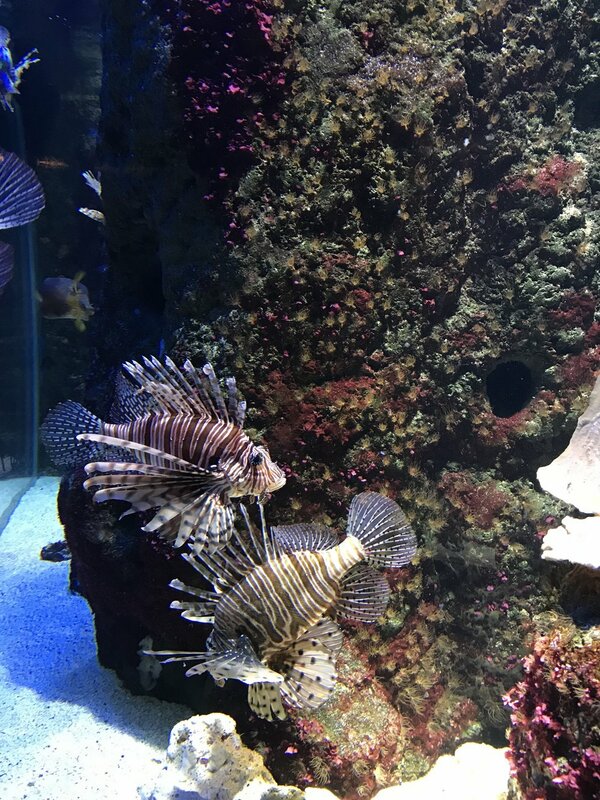 There is also a tactile aquarium where you can touch starfish, sea urchins, and more, it’s definitely an activity the whole family can enjoy. The aquarium is positioned out on a pier so if you look out the windows you seem to be surrounded by the sea, which was pretty cool to experience during the storm. Gros is a newer, more youthful area of San Sebastian that is a popular location to stay if you’re planning on spending a lot of time at the nearby surfer’s beach. It’s also an area known for cute boutique stores, coffee shops, trendy restaurants and has some great pinxtos spots. We ended up here after taking the bus back from our walk to San Juan and ate at a great lunch spot our concierge from our hotel in Madrid recommended. Mainly filled with locals during the workday, something made me think this area would have been much livelier in the summer when all the surfers were in town. To add a dash of adventure to our trip, we decided to drive from Madrid to San Sebastian instead of hopping a flight or taking the train. We wanted a way to see more of the Spanish countryside and a road trip is always an adventure! I mapped out our route ahead of time and it was pretty straightforward as you can take one highway all the way from Madrid to San Sebastian. I also factored in a little lunch stop in the provincial town of Burgos, which was a halfway point. When looking for a place to stop halfway, Burgos quickly caught my attention as I read that the medieval architecture was beautiful and the historic quarter was bursting with busy pinxtos spots. As you cross over into the center of town you cross the banks of the Duero and Arlanza rivers which are lined by these strange trees that intertwine with each other along a walking strip. I can only imagine that in the summer they make a lovely shaded canopy for those who want to walk along the river. Burgos is also known for having the best blood sausage in the country called, Morcilla, which is stuffed with pig's blood, rice, onions, and spices. I probably wouldn’t have ordered it at first if I had known what it was, but I saw several locals eating it at the pinxtos bar and knew we had to try it. It was by far one of the best things I ate in Spain. Look out for a post on favorite restaurants in Madrid, Barcelona and San Sebastian and this little Burgos spot with its Morcilla sausage manages to sneak in there.